Ciena, a leading network strategy and technology company, has recently partnered with The A. James Clark School of Engineering’s ECE department by selecting UMD junior Joseph E. Sirak to complete a competitive Undergraduate Research Fellowship (URF) in the 2016-2017 school year. An industry sponsored URF offers undergraduate students a substantial research experience working in conjunction with an engineer, the sponsoring company, and an ECE Faculty member. This is the first year Ciena has partnered with ECE to work with a student for research. The research topic suggested by Ciena, “Quantitative Comparison of Modern Data Center Network Architectures,” will focus on using a data center network modeling and simulation environment to study packet and flow forwarding behavior in a variety of data center network architectures. The study will support research on available open-source network modeling and simulation tools, and how to apply them to emulate real-world control plane algorithms and data plane traffic patterns. Sirak, is a Computer Engineering major with an emphasis in Cybersecurity. He has been learning from and working closely with Jack Mateosky, a Network Engineer at Ciena, and his team. “Currently, we are reviewing publications and dissertations pertaining to the research topic, and familiarizing ourselves with tools such as OMNET++ that will be used to simulate different datacenter topologies” says Sirak. Ciena, based in Hanover, MD, offers leading network infrastructure solutions, intelligent software and a comprehensive services practice to service providers, small to large enterprises, federal and local governments, and research and education institutions. 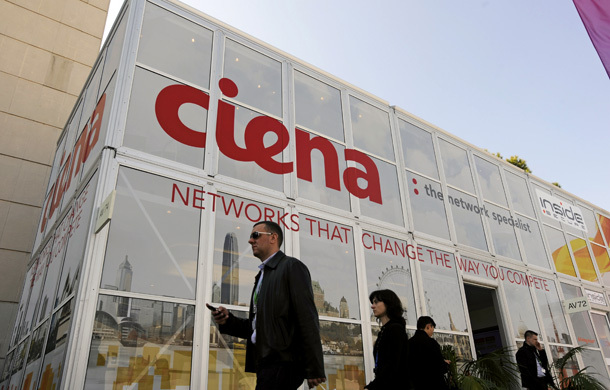 Ciena employs several alumni from ECE who help champion the relationship.